Astronaut Mike Fossum smiles as he is carried in a chair to the medical tent just minutes after landing in Kazakhstan. Three astronauts returned safely to Earth on Tuesday after spending almost six months in space, NASA said. Cmdr. Mike Fossum and Flight Engineers Satoshi Furukawa and Sergei Volkov landed their spacecraft in Kazakhstan early in the morning. They had been at the International Space Station since June 9. 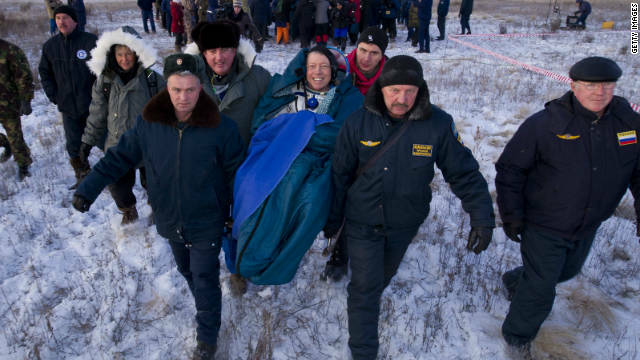 The aircraft landed on its side, which was not unexpected, NASA said, adding that Fossum smiled as he was carried out. Before leaving the station, Fossum turned over command to Dan Burbank, NASA said. Burbank, along with Flight Engineers Anton Shkaplerov and Anatoly Ivanishin, took off for the space station from the Baikonur Cosmodrome in Kazakhstan on November 14. The mission is Burbank's third visit to the space station, but the first for Shkaplerov and Ivanishin. Yes welcome home, I am also jealous I would love to go even on couple year mars trip ! Welcome back, Fossum, Furukawa, and Volkov! I have to admit a bit of jealousy–I would love the opportunity to go to space!